When cabinet ministers show up at committees, they are expected to be able to answer questions about their portfolio. If the question is complex or requires data not readily on hand, a minister will often promise to get back to the committee and the member asking the question. 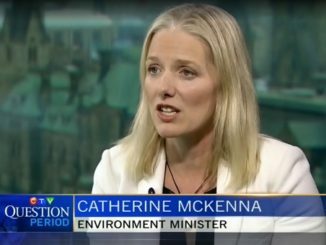 What is shocking here is that Catherine McKenna, Justin Trudeau’s environment minister, was unable to answer a simple question about a key part of her portfolio, the impact of a carbon tax on reducing emissions. Conservative MP Robert Sopuck asked what the impact on greenhouse gas emissions would be with the government’s proposed price of $50 a tonne on carbon dioxide. Watch as McKenna can’t answer what should be a basic question for her. Some people might look at this and shrug and compare it to Question Period which is nothing but political theatre for the cameras. Committee appearances though are supposed to be something different and for the most part they are. Long-time observers of Parliament Hill will tell you that Commons Committees are the places where the heart of Parliament beats, where the real work is done. In the clip above, and in the full appearance before committee, Minister McKenna resorted to spewing nothing but partisan talking points. If those talking points were interspersed with serious attempts to answer questions from the opposition in an open and honest format then she could be forgiven for being a politician. You don’t blame a scorpion for stinging you, it is what they do. In the same way, you don’t blame a politician for being partisan. Unless they are so partisan that basic facts, facts pertinent to their portfolio, escape their notice. 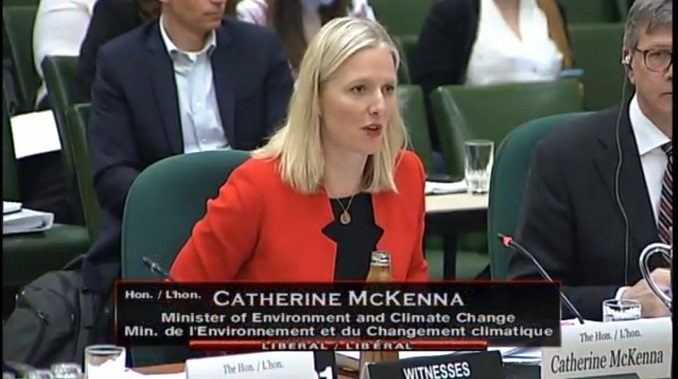 In not being able to answer what the reduction in emissions from a $50 a tonne carbon tax will be, Ms. McKenna embarrassed herself and showed herself to not take Parliament, or perhaps her portfolio, as seriously as she should. Hahaha! Climate Change Barbie has not a clue…just like her boss! She is just to brilliant throw her under the first bus that drives by along with all these other brilliant Libtards. The whole works of these Libtards just has to go. This hole carbon tax is just another tax grab from the government. They’re not going to invest the funds in technologies, ecological solutions, or anything that would actually improve the “climate”. She uses the same echo chamber / fruit cocktail jargon as her boss would. Pathetic people. Be better off going back to coaching at Mac Sports Fitness School. Not only that, she’s bought on to the lie of calling carbon dioxide pollution. It’s not pollution anymore than oxygen is pollution. Also it’s rude to call her Climate Barbie. Barbie would have been able to produce a number with the pull of a string. Look! How did you get your job? I see education and IQ has nothing to do with it. Well, she got her job because P.M. Socks wanted 50% of his cabinet to be female, not based on either I.Q., competence in the field, or pertinent education(just like him) and, it 2015! what ever the hell that means..
Stay on them Brian. These idiots have to go and sooner than later. They keep jamming us with a carbon tax, because liberals live to tax, that’s all they know how do. Facts facts never factor into the money grab. Amazing to read these comments. You people are more than willing to show, over an over, there’s no such thing as a good conservative. She can’t produce a number because the carbon tax has nothing to do with carbon emission reductions. It’s about wealth redistribution to force society out of conventional vehicles and into buses, bicycles etc. This is Agenda 2030 at work and the heads at the UN said we need to fundamentally change the way economics work. They want everything to be measured in a unit of energy as opposed to a unit in dollar terms. They intend to destroy Capitalism and the economic model as it works today to bring in this system.